It is impossible to measure the success rate of our actions. Two Rhino species are present in South Africa, namely the Black and the White Rhino, also known as the Hook Lipped and Square Lipped Rhino, respectively. Since the 1960’s, populations of these species in South Africa have made a remarkable comeback thanks to Dr Ian Player. Elsewhere in Africa and Asia, Rhino populations have plummeted and in most cases become locally extinct. 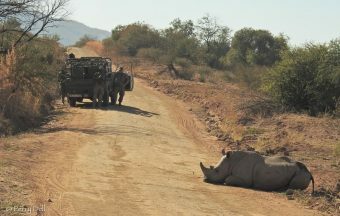 The success in South Africa was mainly due to intensive management and protection, and expanding the range within South Africa to areas where rhinos had disappeared. This success, however, is being rapidly undone before our eyes by the recent onslaught of Rhino Poaching, and their numbers are declining towards extinction. The effective management of Rhino populations requires certain key elements. An individual based identification system is core to the gathering of vital biological data from ground monitoring, such as movements, home range, birth rate, inter-calving periods, associations and aggression, to name a few. With the recent breakthrough in DNA extraction from Rhino horn, it has also become necessary to add to the Rhino database genetic material collected from live Rhinos as another tool in combating poaching. The large ears of Rhinos make it the perfect place to mark Rhinos. By cutting small V, or square shapes into the ears at certain positions, gives the Rhino an individual number. Any observation by monitoring officers of this animal into the future, together with the information that is observed, adds to that biological database. 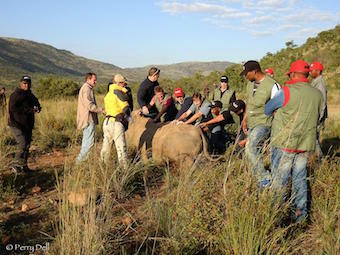 Due to the costs involved in a Rhino immobilisation for this vital management operation, Pilanesberg Park Management has requested The Pilanesberg Wildlife Trust (PWT) to make this a project of the PWT to ensure that this function continues. 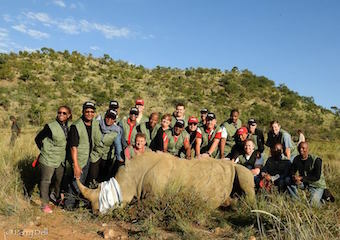 The PWT in turn solicits donors to contribute to the project by sponsoring a “hands on” Rhino capture experience where guests actively take part and assist the Vet and Park crew during the operation. Excess funds are utilised for further Rhino Protection Projects through funding of training and equipment, etc..
By sponsoring a Rhino immobilization not only do you get to experience a ‘once in a lifetime’ event, but you also contribute to the conservation, and furthered protection, of these amazing creatures. 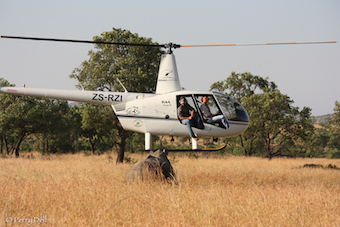 An experienced helicopter pilot, Vet and Park management professionally carry out the Rhino notching operation. The helicopter is used to locate an unmarked Rhino, and is the platform from which the Vet darts the Rhino. The helicopter is also used in guiding the animal to suitable working areas and away from danger. We do not supply a vehicle or any refreshments. If you need us to quote on any of this please advise. Once the Rhino is adequately sedated, ground crew and guests move in on foot and carry out the necessary procedures of notching, and DNA collection. NB: To ensure a friendly work situation and an exclusive participation, the group size is limited to 15 persons per Rhino. Where necessary the group can be increased at the discretion of the PWT. In winter it is possible to notch 4 to 5 Rhino back to back. Any more than that will need approval from Park Management. Summer months are limited to 2 or 3 Rhino, at the discretion of Park Management. 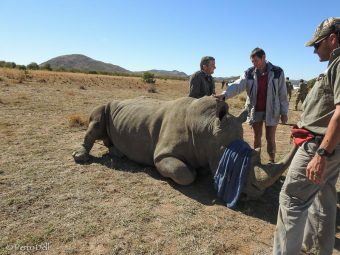 Where possible, guests are requested to assist the Vet and Park Management with the Rhino, under the guidance of the experienced Wildlife Vet and Park staff. Due to hot day temperatures, and the inability of a sedated Rhino to control its body temperature, these operations are conducted early in the morning before the ambient temperature goes above 24 degrees Celsius. In summer this means a pre sunrise start, but in winter the notchings can start later in the day. Please note that the rate charged by the PWT does not include any vehicles to take guests to the notching. Nor does it include any meals or refreshments. These can be quoted for if needed. Early morning meet up with guests at prearranged point. Park Ecologist – Steve Dell – will give guests a briefing on the general aspects of the rhino, poaching and procedure, as well as “do’s & don’ts” while at the Notching. The Vet will also give info on the veterinary procedures that will be performed. Thereafter the Vet and Pilot will get airborne to find a suitable Rhino and call it in on the radio to the parties on the ground. Once the Vet finds a suitable Rhino we all move to the area the Rhino is in. After the Vet darts and immobilises the Rhino, the guests will be advised as to when they may safely approach the immobilised Rhino. 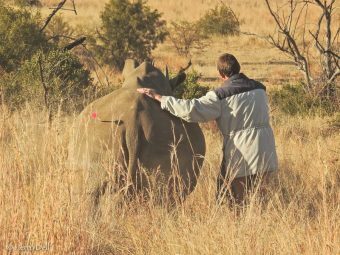 Immediately after the Rhino is immobilised the Vet and Park Ecological Services will do the necessary notching and DNA, etc., collection, with the assistance of the guests. Once all veterinary and ecological work is done, and in consideration of the Rhinos’ absolute welfare, individual and group photos can be taken. When all the required aspects are completed the Vet will reverse the anaesthesia, which wakes the Rhino up within 3 minutes. At this time all guests will be at a safe distance, and quietly watching the rhino wake and move off to continue its day! The whole experience can take between 90 minutes and 3 hours, depending on group numbers and unmanageable factors. The Rhino’s safety, welfare, and dignity, is our priority at all times. The Rhino notching will be halted immediately if the Vet attending to the Rhino decides it is at risk. NB – The PWT does take responsibility, if for any reason beyond its control, the helicopter and / or Vet cannot get to the notching booked for the day for reasonable reasons. Though it must please be noted that we have never had to cancel!! This is an amazing experience that you will remember, and cherish, forever! Contact Perry Dell on manager@org.za to arrange participation!